This the tale of how four young men from western New York came to watch the greatest comeback in NFL playoff history–the Buffalo Bills overcoming of a 32 point deficit against the Houston Oilers–in less than hospitable surrounding; a seedy bar in Texas. It was noon Texas time, and we were scrambling to find a place to watch the game. We finally stumbled upon a hole-in-the-wall on the outskirts of Amarillo. We walked into a shadowy bar that if I’m not mistaken, was the setting for Texas Chainsaw Massacre. The atmosphere was dark and murky and we could feel the eyes of the other patrons on us, heavy with suspicion and contempt. 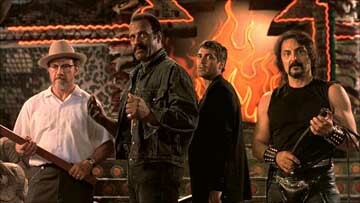 The occupants of one table in the back were a particularly grizzled bunch that were reminiscent of the bar scene from Dusk Til Dawn. We made our way to the front and took a seat at the bar, where the bartender was describing to the bar’s manager, events from the night before: a handful of fights, a couple of stabbings, limited gun-play. She would go on to describe it as a typical Saturday night. Note: I’m not making that up. As the bartender checked our driver licenses, she eyed us warily. We told her that it was in fact about sixty miles from Buffalo. “You’re not Bills fans are you?” She asked with just a touch of petulance in her voice. We informed her that two of us, Lance and Al, were in fact Bills fans. I told her that I was a Pittsburgh Steelers fan, and one of us, Matt, was actually a Houston Oilers fan (we assumed if things got ugly, Matt would be stabbed last). “Well, you boys will be okay…as long as the Bills lose,” she said jokingly…but not really. Note: After hearing that I was a Steelers fan, the manager explained to me in great detail why Texans hate the Pittsburgh Steelers and their fans. The visual aids he used were disturbing. The game began and the Oilers dominated for the entire first half, taking a 28 to 3 lead into halftime. With every touchdown the Oilers scored, the mood lightened, the other patrons around us became friendlier and the guys from the back table even seemed magnanimous. Does it snow a lot where you live? Are Canadians as polite as people say? Can you get good chicken wings around there? Larry’s Cantina in Westfield, New York has the best wings anywhere. Why don’t you talk like your from New York? If you’re from New York, why don’t say things like, “yo” or “yous guys”? First, we’re not from Yonkers. Second, you’re thinking of Rocky Balboa, a fictional character from Philadelphia. We were all having a good time, the fear of imminent bodily harm had subsided. The second half began with Houston scoring another touchdown, increasing their lead to 35 to 3, and things were downright jovial. Then something odd happened: as Houston kicker, Al Del Greco, was kicking off, the wind shifted the ball in the tee, resulting in a squib kick that went only a few feet, and everything began to change. 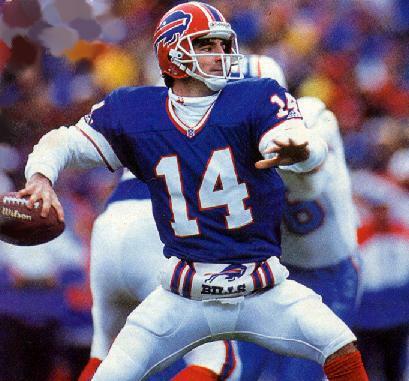 Frank Reich began to throw touchdown passes,Warren Moon began to throw interceptions, and the mood in the bar began to shift. With every play Lance and Al whooped and hollered and slapped high fives, much to the disgust the others around us. At one point Buffalo receiver, Don Beebe, scored a touchdown on a play which he had clearly stepped out of bounds. The anger in the room was growing palpable. The fear of imminent bodily harm had returned with a vengeance. As Buffalo kicker, Steve Christie, lined up to kick the game winning field goal, Lance and Al were in a state oblivious delirium, I was fearing for life, and Matt was about to experience the phrase “adding insult to injury” in a very literal way, as he was about to watch his team blow the biggest lead in NFL history, and possibly be stabbed in the side of the head. Me: Matt, when we came in did those guys at the back table have eye-patches and huge scars on their faces? Me: I certainly don’t remember that big guy on the right fondling a blood stained machete. Matt: And wearing a T-shirt that reads: Remember The Alamo: A Great Day Of Victory. Me: We should get out of here. I could hear Ennio Morricone music rising in the background. 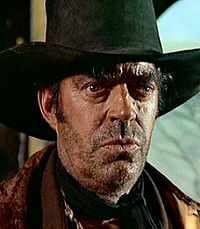 You know, that music from Sergio Leone Spaghetti Westerns, the music that would play just before Jack Elam would be brutally killed (and jukebox wasn’t even plugged in). Steve Christie’s kick sailed through the uprights giving the Bills the greatest comeback in NFL history, and we sailed out the door before weaponry could be wielded. The Buffalo Bills had survived that day, but more importantly, so had we. Reblogged this on The Papist Squirrel. I remember watching that game here in Canada. Big Warren Moon fan because he used to play in the CFL. Hated the Bills because all of the US networks we got had the Buffalo feed, and we just got so tired Buffalo newscasts having nothing else to discuss other than the Bills and fires in Cheektowaga (honestly, who has that many fires???) Frank Reich wasn’t even the starter…. I can’t remember if Kelly was injured, or if he just got pulled because the game (we thought) was a laugher. That was definitely one of the most memorable NFL games I ever watched. Jim Kelly was injured, probably in a fire in Cheektowaga. Ah, hah, hah. I don’t even like football and this was awesome. You have such a way with words. Frequently words have their way with me, it’s quite unpleasant. Were you in that bar at the time?